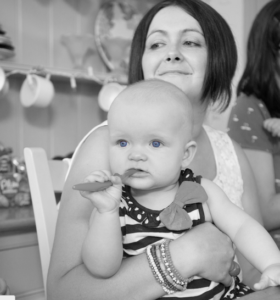 Rebecca Gwynne, a busy mum of two young daughters, writes the popular UK foodie/music/parenting blog called Munchies and Munchkins. With the back-to-school season fast approaching, she kindly agreed to visit with us to share some insights into how to feed a growing young family well. So all you busy Mums and Dads out there, facing the same return to the annual routine, take a minute now to discover what she’s learned about how the technique of sous vide cooking with our SousVide Supreme water oven makes that process easier and more convenient for her. She shares her thoughts and her recipe for Sweet and Sticky Sausages (among her family’s favorites, or as she’d say ‘favourites’) with us all now. You’ll find additional great sous vide recipes on her site. SVS: As a busy food blogger and Mum how do you find the SousVide Supreme water oven helps you to balance your workload? RG: I use it to bulk cook meats at the beginning of the week and then I quick chill and either place in the fridge or freezer depending on when I want to use them. It means I have perfectly succulent meat to hand to add to curries, stews or simply griddle. 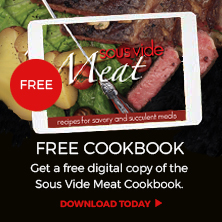 SVS: Since using the products, what are the main benefits of cooking with the SousVide Supreme water oven? RG: Time saving is definitely the main benefit, but coming in a close second is the fact that I’m guaranteed restaurant quality food every time without a lot of extra effort. SVS: In terms of cooking for your children, what kinds of foods do you cook with it? RG: Sausages, chicken breasts, sweet potato are probably the things I cook most. It’s also great for cooking chunks of diced beef so that they are soft and tender rather than chewy. SVS: What are the other food items you find yourself cooking with the SousVide Supreme water oven? RG: We love to cook ribs, burgers and chicken thighs amongst many other things. We have also been experimenting with silky scrambled eggs. Our favourite sous vide recipe is definitely the slow cooked ribs. SVS: Is the SousVide Supreme water oven appropriate for cooking baby foods? Why? RG: Yes, I’ve used it for weaning my 8 month old baby. We cook chunks of sweet potato, carrots or apples and I either mash it by hand whilst still in the vacuum bag (before I open it) or as she has started to eat finger foods I just place it on a tray in front of her. SVS: Beyond the benefits of time savings and ease of use, why do you like to use the SousVide Supreme water oven to cook for your children? RG: You don’t lose nutrients during the cooking process. It’s always thoroughly cooked, yet never dry or burnt. SVS: How does the SousVide Supreme water oven fit in with your other cooking equipment – do you use it a lot during the week or for special occasions only? RG: It’s got its very own special spot in my kitchen and I use it at least two to three times a week. SVS: Do you find that the SousVide Supreme water oven enables you to be more adventurous with the little time you can devote to cooking? SVS: Which key sous vide recipes or ingredients would you recommend that our community tries for both babies and children?